30 Pro was created to be the ultimate, powerful, portable controller. Now meet N30 Pro 2. N30 Pro 2 refines every element of its predecessor with new features like motion controls, vibration, USB-C and turbo functionality. Still inspired by the most powerful weapon in Konami's 2D masterpiece, Castlevania: Symphony of the night. It is built with clickable joysticks and features a full-sized controller button set so you can play any game, anywhere. The Pro controllers aren't just full-sized wireless bluetooth game controllers - they were designed with respect for the classics. We paid extra attention to the most critical characteristics like the D-PAD, to make sure it feels exactly like you remember it. 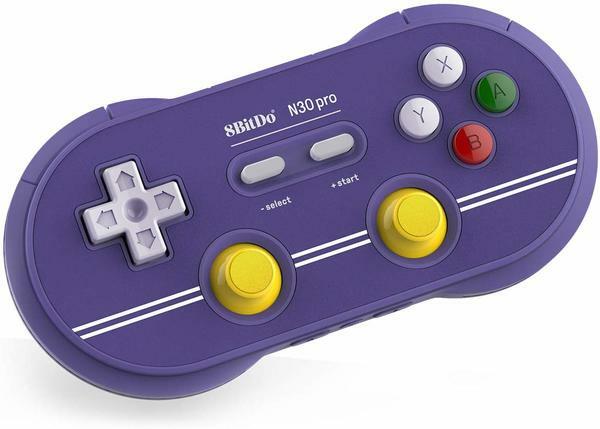 8BitDo controllers are designed to be as versatile as possible with each of your modern devices. Easily pair your controller as an X-input or D-input device via bluetooth. And you can even use it as a wired USB controller with the included USB cable. We're regularly updating the firmware with new system compatibility like the Switch, Raspberry Pi and more. A wired mode? That is awesome! Especially if that means the bluetooth can be switched off completely. I mean there are far too many radio waves already around there. I&apos;m happy to pick up some wires again. Shouldn&apos;t the left stick be grey? Wait, what does this have to do with Symphony of the Night?